Igor Rezola Dizebi (www.dizebi.com), Basque Country, July 2011. Basque artist Igor Rezola hiding behind moniker Dizebi was born and grew up in a small provincial settlement Isasondo. He obtained first conscious graffiti experience in 1998. At present he works with various practices and media. In whole his creative activity can unofficially be divided into two periods: figurative and conceptual. As many street artists Dizebi started from graffiti-writing, but being interested in communication with audience wider than frames of subculture he realized the privacy and limitations of its language. So he switched to realism which was supported by parallel study at school of arts. In his paintings he emphasized the technical part which widely influenced the stylistics of his works. Realizing the benefits of an image comparing to code font he faced the problem of limitations again — his works had attractivity and guaranteed full contact with the audience but couldn’t be always interpreted right. This made him return to fonts, but not code ones — to typographical fonts due to the fact that standard “book” fonts are easy to read. Being graffiti writer and realist painter in past, conceptualist and actionist at present Dizebi often places philosophical questions about graffiti nature, its legal/illegal status, limitations and boundaries, fragility, emptiness and chaos often analyzing his self inner contradictions. In this wall intervention Dizebi continues his actionist experiments initially lowering the meaning of style and technique in favor to idea and action. 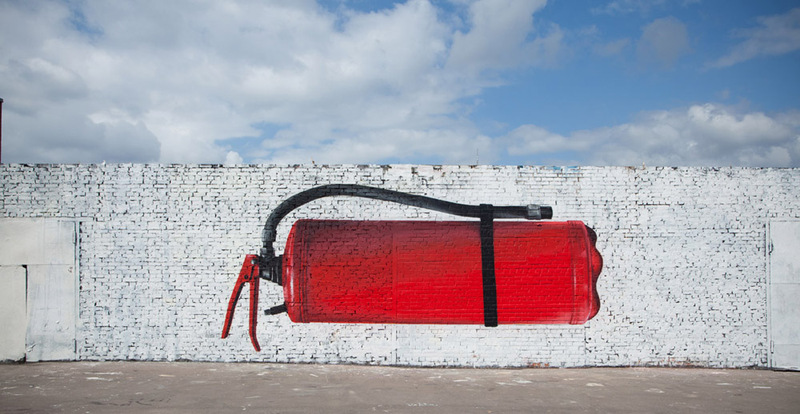 This work represents one of the newest street art techniques — extinguish dripping — exaggerated paint sagging after spraying it with an extinguisher. 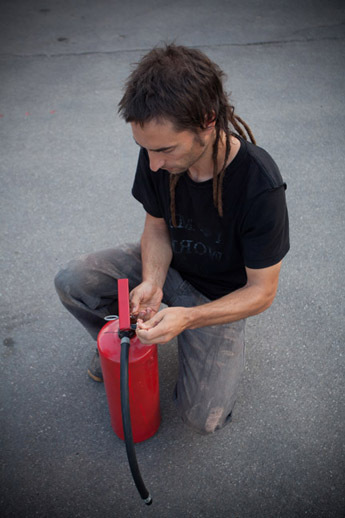 There is also a contrast of two media similar by effect — aerosol spray and extinguisher where one is expressed by the other. The intervention includes two stages — the painting — i.e. 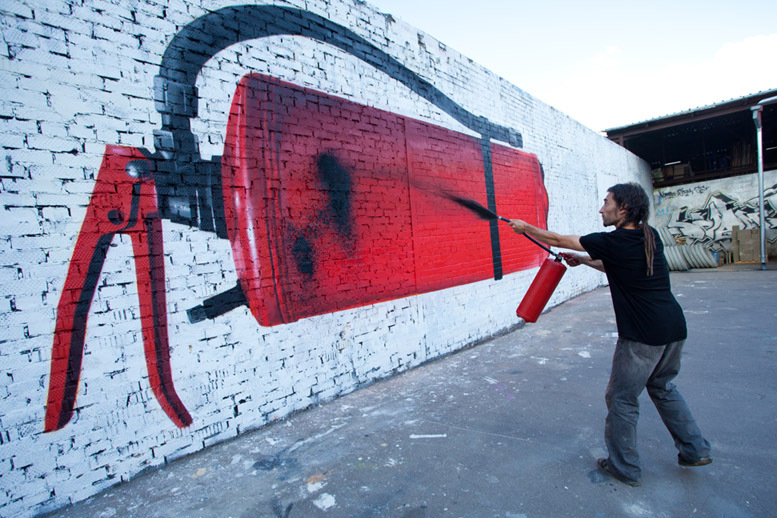 creation of realistic image of an extinguisher and performance during which the image is sprayed over by real (physical) extinguisher filled with black paint. 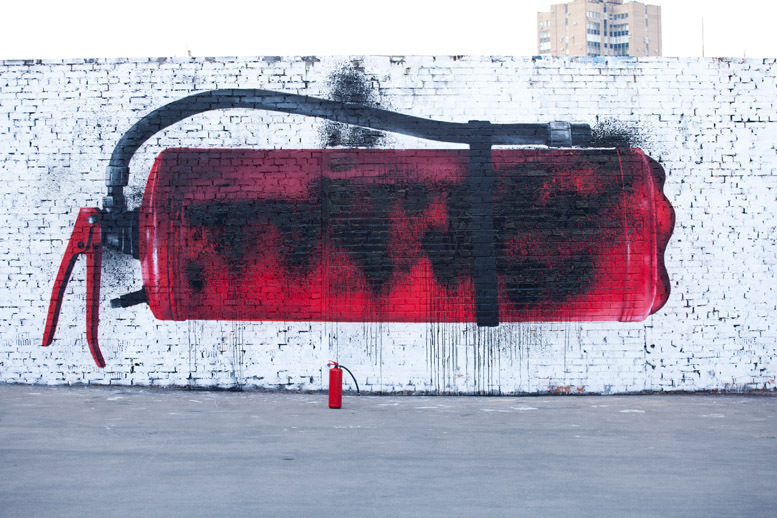 Thus the work contains iconic and index symbols the same time referring to one object (extinguisher) illustrating a basic McLuhan thesis — "the medium is the message". — The organizers express gratitude to “Protvor” gallery and 4 ROADS STEREO for contribution to this layer creation and Veselov Andrey for photo-documentation.